At the 2018 AGM Gwyneth Gibbs, our Chairman, noted that this had been a year of achievements and of changes. She paid tribute to fellow committee members and the Society’s Urban Group for all their work, and to the prompt action, when required, from SKDC’s Conservation Officer and planners who helped prevent changes to buildings that would spoil the Conservation Area. One of the highlights of the year had been the installation of a Blue Plaque on the front of Black Orchid’s shop at 7 St Mary’s Street to commemorate Nelson Dawson, Arts & Crafts artist, metalworker and enamellist (1859-1941). This was the Society’s second Blue Plaque. For more information about Nelson Dawson see our article on pp.6-7. There were two very positive pieces of news that Gwyneth was pleased to announce. All the works required to prevent cars from parking along and on the verges at the Bottle Lodges had now received permission and were going ahead. She was very grateful to the Burghley Estate for their efforts to preserve the most beautiful entrance to the town. She also noted that it looked very likely that an Article 4 Direction (that removed permitted development rights) would be introduced in the central area of Stamford. 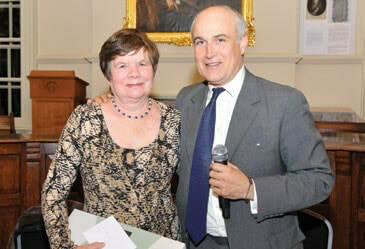 Our President, Orlando Rock, paid tribute to Gwyneth, who was standing down after 11 years as Chairman, saying that the Society had been extremely lucky that she had taken on the role and much had been achieved during that time, thanks to her quiet persistence and perseverance. The Society was also sad to lose two other members of the Committee: Mike Sockett, who was standing down after 11 years of taking on multiple activities, and Martin Lander who has been our Treasurer for the last three years.